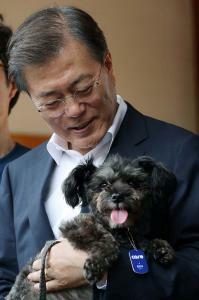 Rescued Shelter Animal becomes South Korea’s ‘First Dog’ – FIREPAW, Inc.
Four paws-up for South Korean President Moon Jae-in’s promise for public education about the need for serious commitment for pet ownership, and to increase public awareness about the number of abandoned pets that occurs when people do not take their commitment to pet adoption/ownership seriously. SEOUL: South Korean President Moon Jae-in on Wednesday welcomed a rescue dog to his official Blue House residence, delivering on a campaign promise to boost awareness of the fast-growing numbers of abandoned animals accompanying a surge in pet ownership. Tori, a four-year-old black mixed breed, becomes the first shelter dog to attain the title of First Dog, joining Moon’s two other pets, a 10-year-old Korean-breed Pungsan dog called Maru and a former stray cat, Jjing-jing. President Moon’s predecessor had faced criticism for leaving behind nine Korean Jindo breed dogs at the Blue House when she was removed from office over a corruption scandal. South Korea has often been criticized for its custom of consuming dog meat, although the trade has fallen off in recent years. Pet ownership has grown rapidly, with nearly a quarter of all homes having one, but the trend has also boosted the flock of abandoned animals in shelters nationwide. The government spent nearly 11.5 billion won ($10.3 million)on care for about 87,100 such animals in 2016. A change in perception is long overdue, say some pet owners. Previous Pigs are highly intelligent creatures with heart: Should people be eating them?